It's been a very busy few weeks in our house and we've been in desperate need of some time out. Runny noses, crazy diaries and cross country road trips have left us both feeling more than a little frazzled. 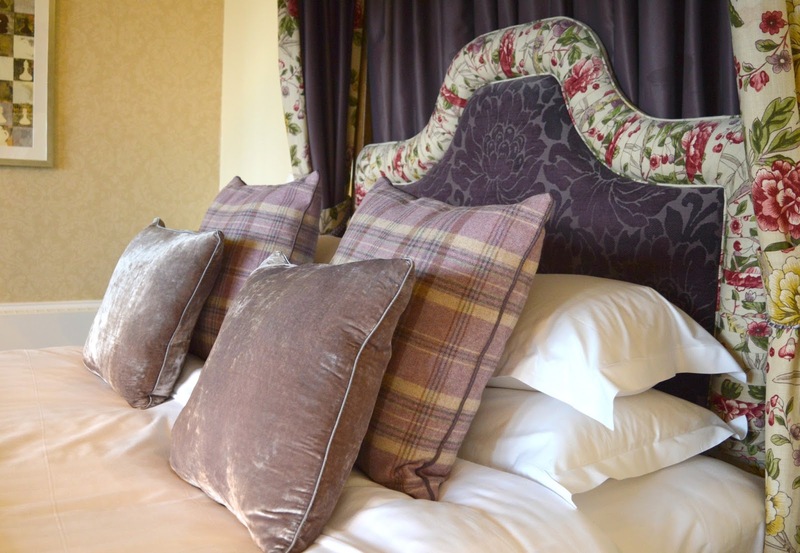 So when an opportunity arrived to indulge in a romantic stay at Matfen Hall we were quick to clear our schedule for the weekend. 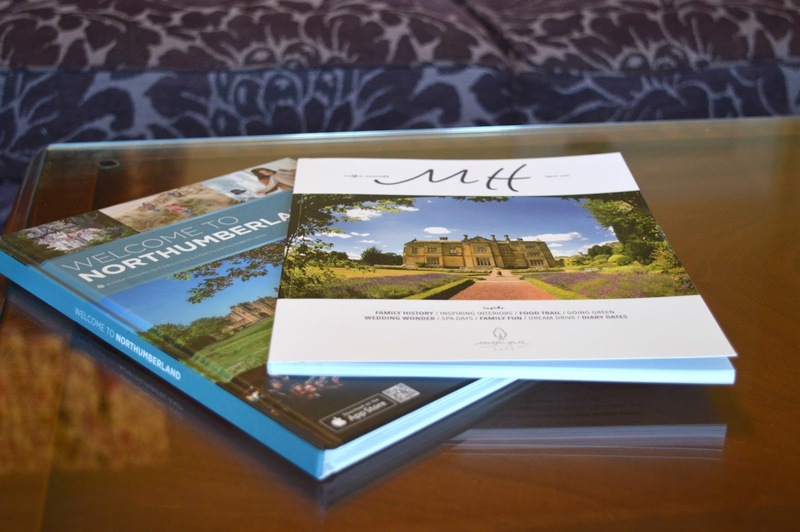 Set in 300 acres of stunning countryside, Matfen Hall in Northumberland is one of the region's loveliest country hotels and the perfect spot to indulge in some time out from your busy life. Escape reality and hide away in a stunning stately home that'll have you feeling relaxed in no time. 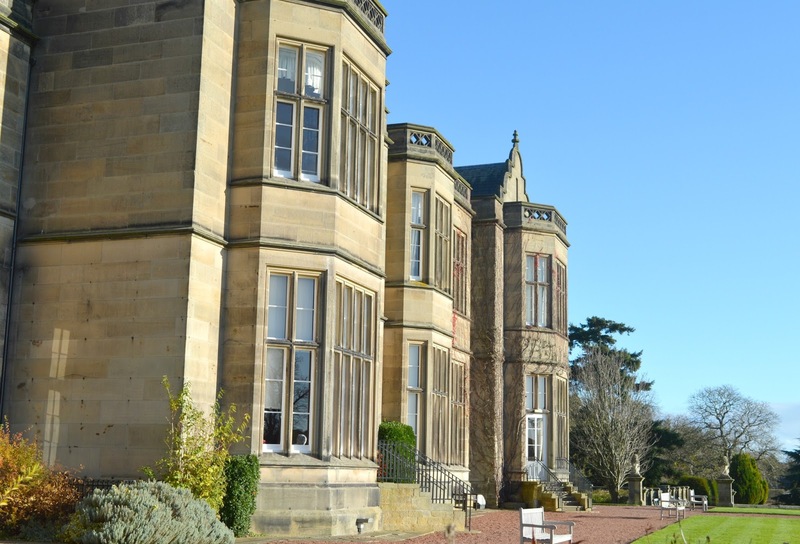 An easy drive from our home in Newcastle, Simon and I arrived at Matfen Hall on a beautiful Saturday afternoon and eagerly parked up and raced each other to the front door. We couldn't wait to throw down our bags and climb into our comfies, an afternoon of pampering was just what the doctor ordered. Our visit began with an afternoon at Aqua Vitae. We'd been curious to try Matfen Hall's spa for a while. 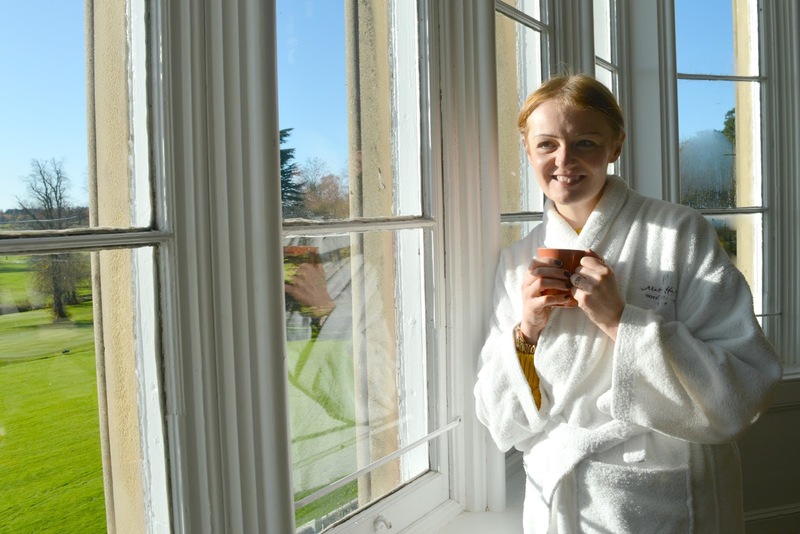 We like to think of ourselves as quite the spa experts these days having visited some of the best in the region and we're slowly working our way round them all. Arriving at the spa a few hours before we could check into the hotel, there was some initial confusion about where to get our robes, followed by some problems locating towels and finishing with a bit of a battle to find a locker that we were able to use. We were a little disappointed on arrival that there was no tour of the facilities or guidance on the locker system, it left us slightly frustrated, but once we'd got over that we were keen to start our afternoon of pampering. The Aqua Vitae spa at Matfen Hall is pretty small and we were a little underwhelmed but it does offer a nice range of facilities for the space including a 16 metre swimming pool (definitely its best feature) and a small number of rooms for different sensory experiences. We enjoyed shutting ourselves away in the steam room and sauna before Simon retired to a chair by the pool for a little shut eye and I headed to the treatment rooms for an indulgent massage. My massage was heavenly, one of the best I have ever had and although it was a relaxing massage with gentle pressure my therapist was happy to change the pressure slightly around my knotted shoulder muscles which made them feel instantly better. I was so relaxed I'm pretty sure I had a little snooze because it was all over before I knew it. I felt so lovely afterwards and enjoyed a nice bit of husband free time in the Relaxation Room where I lay down with a trashy mag and truly switched off. How often do you get to do that? I stayed there probably longer than I should have done but really didn't need to feel too guilty as when I found Simon by the pool he was having a snooze. Turns out he couldn't be bothered to swim and had spent a good hour enjoying some peace and quiet, listening to some music and having a sleep. Heaven! As the clock rolled round to 3:00 pm we realised it was check in time and so couldn't resist quickly getting showered and making our way into the hotel reception to get the keys to our room. Our home for the night was a "Principal Room" in the original part of Matfen Hall and as we swung open the door our jaws hit the floor. Our room was stunning! Easily the most beautiful room we have ever stayed in, we had to pinch ourselves as we dumped our bags and began to explore - it was the kind of room we'd only ever seen in the movies. Absolutely huge with high ceilings, comfortable lounge area and a four poster bed (another tick for the bucket list! 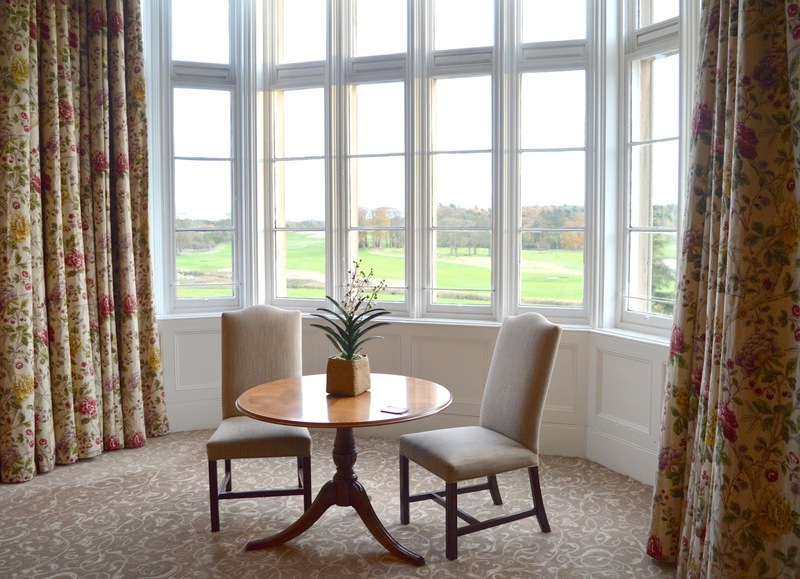 ), our room also boasted a picture perfect view of the stunning golf course with huge dramatic floor to ceiling windows - I was smitten! 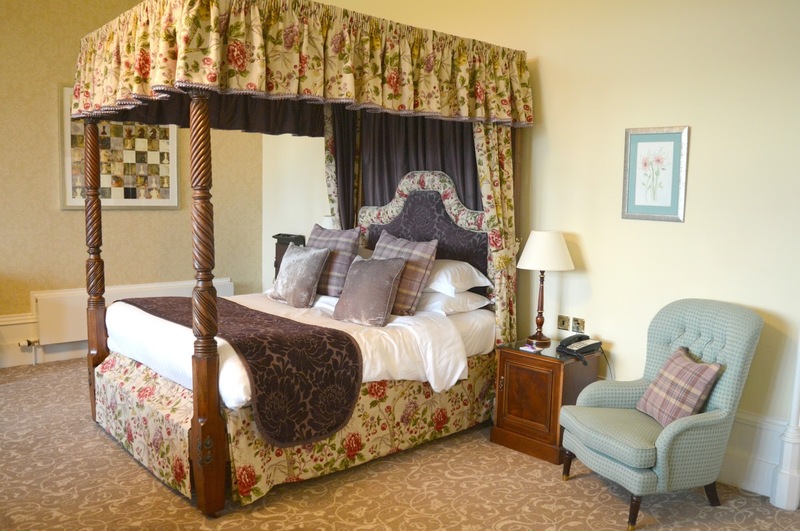 I think you'd struggle to find a bedroom as beautiful as this one in the whole of the North East - perfect for a romantic weekend away, it came as no surprise when I discovered that a lot of Matfen Hall's bride and grooms use this room. 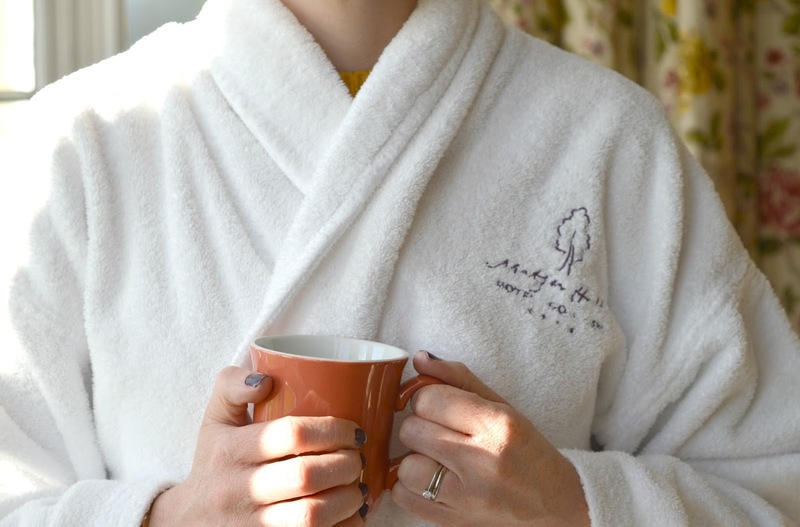 We wasted no time in snuggling into our very fancy Matfen dressing gowns and Simon was quick to raid the complimentary chocolates, Ringtons biscuits (that man can sniff food out a mile away!) and settle down with the romote control whilst I lovingly examined all of the toiletries in the huge bathroom. If we could design our dream bathroom at home it would pretty much look like this. A massive walk in shower, his and hers sinks and a huge tub made me squeal with joy and it took all of my will power not to run myself a hot bubble bath. I will admit we were very tempted to spend the rest of our afternoon in our uber fancy bedroom but, unfortunately, I had a blog deadline that meant finding a nice corner of the hotel to do some work on my laptop without annoying my husband. We reluctantly left our room and went on a little explore to find our perfect location. 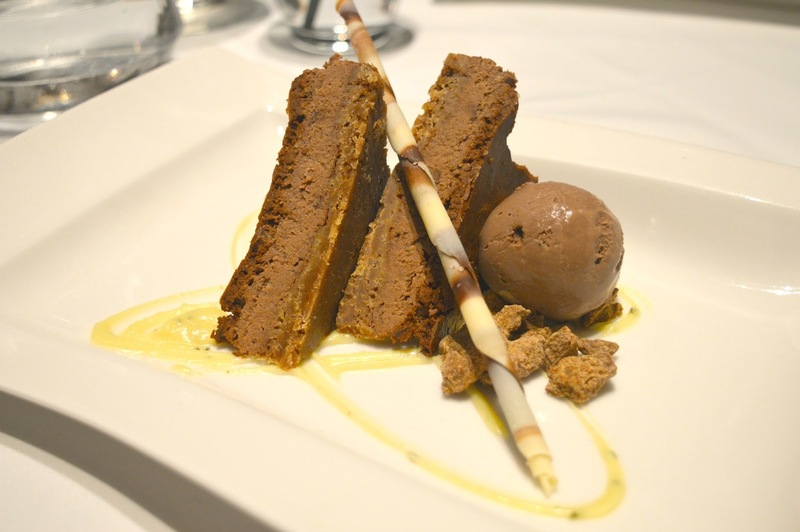 It wasn't long before we stumbled across the Conservatory, a beautiful bistro overlooking the golf course, with a delicious light bites menu, speedy wifi and plenty of seats. We ordered ourselves a couple of coffees and couldn't resist some muffins to go with them, after all it's impossible to enjoy a hot drink without cake when you're in such beautiful surroundings! I got so much work done in the Conservatory, much more than I ever do at home which makes me think that maybe I should just move into Matfen Hall? I was so engrossed in my work that I didn't even notice that late afternoon had turned into early evening and suddenly we were ordering G&Ts from the gin menu. The Conservatory was one of the nicest places I've visited in a long time and as we left to make our way back up to our room to get changed for dinner I promised the staff that we'd return another time for afternoon tea. 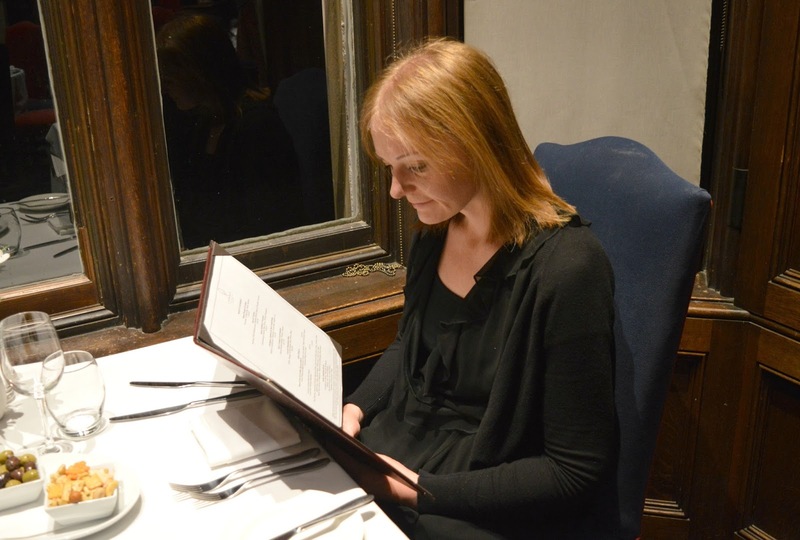 Our dinner for the evening was booked in Matfen Hall's 2 AA rosette Library Restaurant at 7:00 pm and we turned up promptly and were shown to a cosy table by the window. The restaurant was busy but there was a lovely atmosphere with a huge variety of people sitting down for dinner. A large group of ladies dressed in their best party clothes were at the centre of the restaurant, plenty of couples were enjoying romantic meals and groups of friends were gossiping about their absent other halves. We studied the menu whilst tucking into a nice selection of bread. Anyone who knows me will know how the bread basket is my absolute weakness - it's the only time I ever let myself fully indulge in bread and butter so I like to make the most of it. I was slightly disappointed that the butter was solid and tore holes in my lovely fresh bread but I just about managed to slather on greedy amounts. For my main course I opted for the Roast Saddle of Venison (£24.95) - despite the earlier treats in the Conservatory my belly was growling and when my food appeared I was quick to tuck in. It was beautiful! 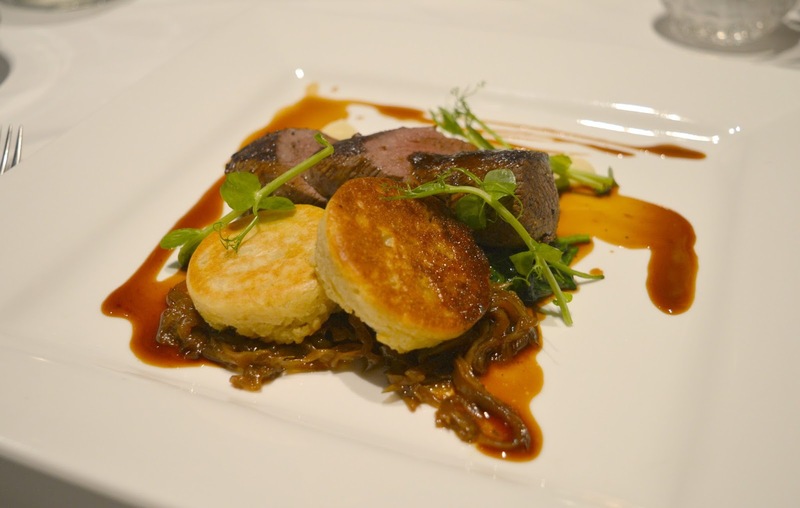 Perfectly prepared meat, so tender and pink served with caramelised onions and pear puree sitting on Thyme Crumpets. Simon opted for the ultimate date night treat, Steak! 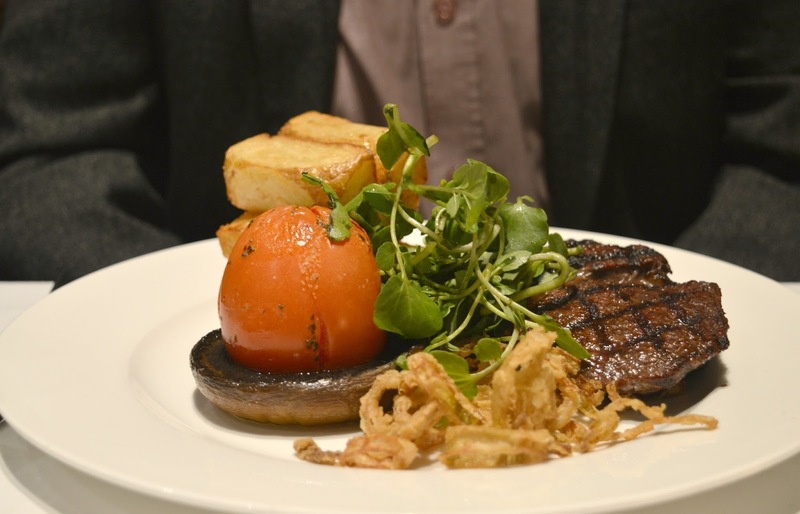 He chose the Locally Sourced Rib Eye Steak (£23.95) which came served with the largest chips I've ever seen, a roast plum tomato, mushroom, crispy shallot rings and a very generous jug of peppercorn sauce. Lucky for me he got full pretty quickly (so full that he didn't even touch the healthier parts of his plate!) so I managed to pinch a couple of giant chips which I dipped in the sauce - delicious. Of course, we're never to full for dessert and having skipped starters (we will always pick a pudding over an entree!) we were keen to satisfy our sugar craving. I went for the most indulgent dish on the menu, the Baked Chocolate Cheesecake (£7.25) served with white chocolate and lavender cause and caramelised white chocolate. It was a very generous portion and so deliciously rich, even a food expert like me struggled a little to finish it. 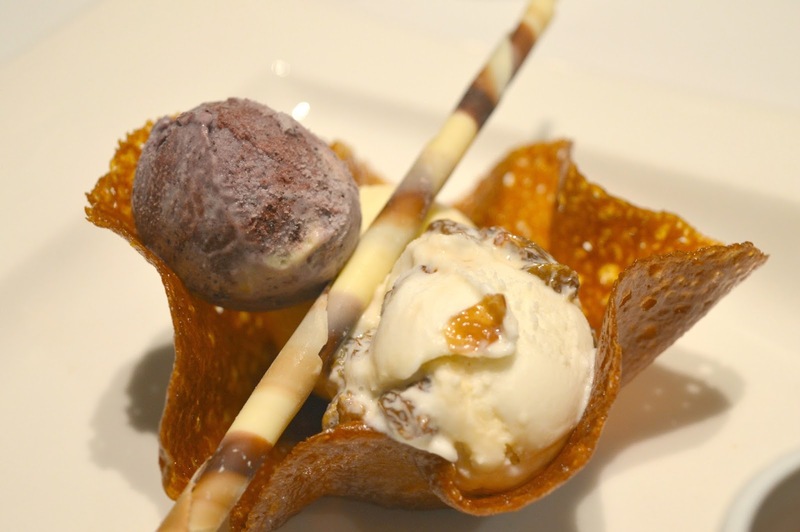 Simon went for Homemade Ice Cream served in a tuille basket with chocolate fudge sauce (£6.25) which I just couldn't get excited about. I love ice-cream as much as the next person but have to admit I'd never order it in a restaurant when there are so many other tasty treats on offer. We were very impressed by our evening meal and both agreed that the Library at Matfen Hall is definitely a destination restaurant. We'd think nothing of climbing into the car and driving there just for dinner and it's something that we'll certainly do in the future. With our meals finished we were so full it felt like we were bursting out of our clothes so we sleepily climbed the stairs to our beautiful room and crashed out on the four poster bed within minutes. We had meant to snuggle up and watch some TV but that was never going to happen. The combination of delicious food and my earlier massage had me fast asleep as soon as my head touched the pillow. We woke the next morning and both agreed that we'd had an amazing night's sleep, so good in fact that time was ticking on and the end of breakfast time was fast approaching. We are definitely the kind of people that like to make it down to breakfast as early as possible to avoid the rush so the fact that it was gone 9:00 am by the time we hit the restaurant shows what a restful nights sleep we had. We arrived at breakfast about 45 minutes before the end of serving time along with, it appeared, everyone else. The restaurant was full to the brim with bleary eyed people eating much needed breakfast dishes. Luckily we didn't have to wait long at all for a table and quickly busied ourselves at the impressive continental selection which was displayed in the middle of the room like a rather fancy breakfast centrepiece. It's always so hard not to overindulge at a buffet and between us we ended up with cereal, pastries and plenty of toast thickly spread with butter and marmalade. Unfortunately our over indulgence wasn't helped by the wait we had to put in our hot food order. The restaurant was busy but things seemed to get a little chaotic with wrong coffee orders appearing and people who had arrived quite a while after us placing their order first. Not exactly a big deal but it definitely did lead us to grabbing more pastries than we should have had! Orders finally placed we jealously watched all the tables around us tucking in before ours turned up and it was time for the taste test. 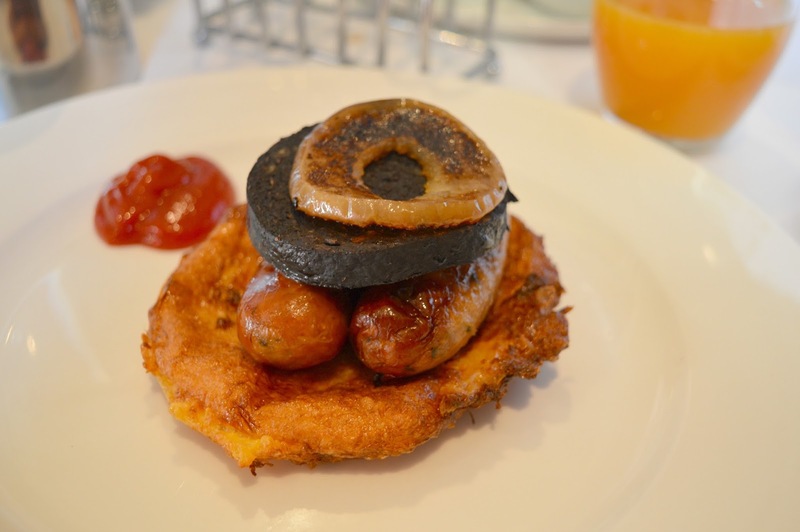 I opted for the Northumbrian Breakfast - the local sausage and caramelised apple and black pudding were delicious but I wasn't too keen on the eggy bread which was a little too greasy for my liking. Simon's homemade crepes looked far better and I was quite annoyed at myself for not having ordered the same. 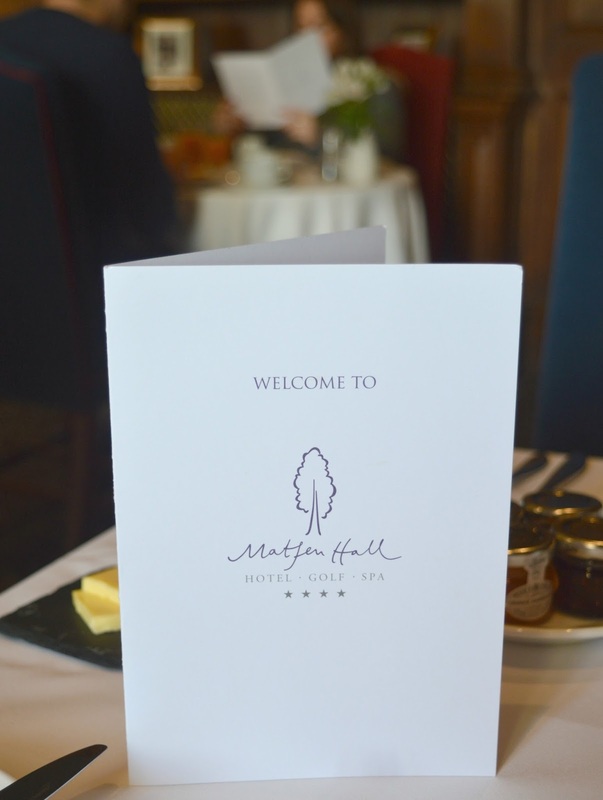 It was a shame that our experience at breakfast wasn't as wonderful as our dinner the night before but it was soon forgotten about when we went for a little stroll round the Matfen Hall grounds before check out. The sun was shining and although it was cold the sky was that perfect shade of Winter blue that makes you love life. I can see why so many people choose to get married at Matfen Hall, the outside is breathtaking and I spent quite a while embarrassing myself by prancing up and down the gravel paths pretending to be lady of the manor. We felt quite sad climbing into our car and saying goodbye to Matfen Hall and although there were a few parts that left us slightly disappointed, it was a really lovely stay and we will most certainly be returning for an evening meal very soon and I quite fancy afternoon tea in the beautiful Conservatory. I'm also wondering if I should maybe take up golf .. but that's probably something to think about at another time! 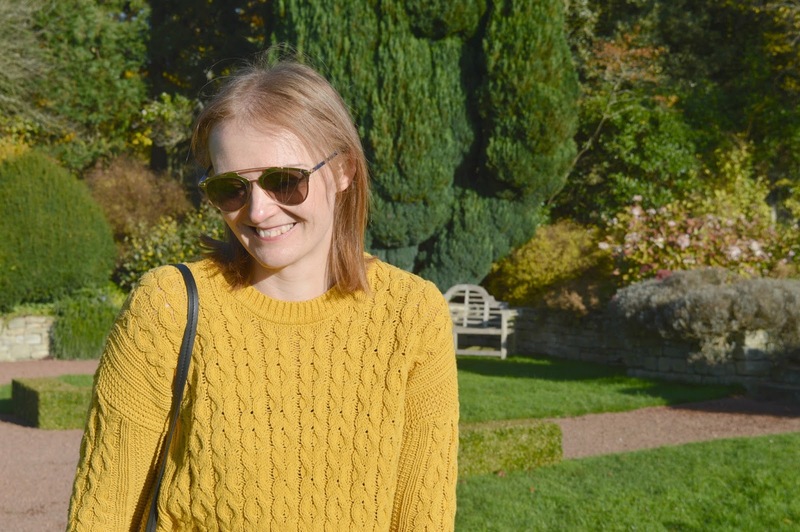 We were invited to stay at Matfen Hall and received complimentary use of the spa, massage, dinner, bed and breakfast in exchange for an honest review. Over indulgence in The Conservatory was paid for ourselves! 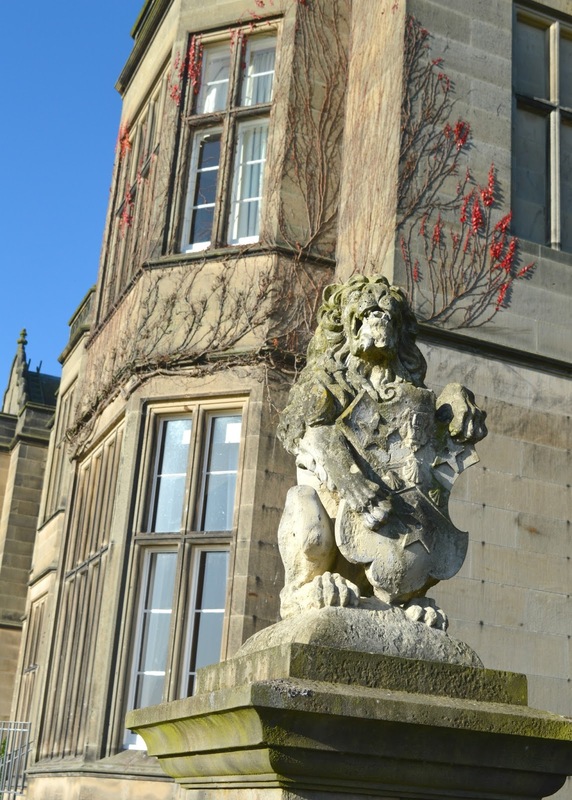 Let me know if you've ever stayed at Matfen Hall and what you love most about it! Oooh what a gorgeous hotel! Shame about a couple of niggles but I'm sure it's nothing a night in that lush bed would help me forget!